Caption: "Examination of a Witch" Thompkins H. Matteson, 1853. Description: Generally supposed to represent an event in the Salem witch trials, an earlier version of this painting was exhibited by the artist in New York in 1848 with a quotation from John Greenleaf Whittier's book Supernaturalism of New England, 1847: "Mary Fisher, a young girl, was seized upon by Deputy Governor Bellingham in the absence of Governor Endicott, and shamefully stripped for the purpose of ascertaining whether she was a witch, with the Devil's mark upon her." See, "A Study of the Life and Work of the Nineteenth Century Artist Tompkins Harrison Matteson (1813-1884), by Harriet Hocter Groeschel, M.A. thesis, Syracuse University, 1985, pp. 37-38. 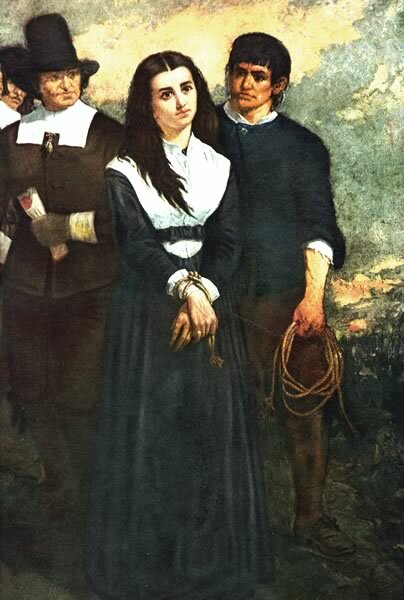 Caption: "Witch Hill," or "The Salem Martyr"
Description: Oil painting by New York artist Thomas Slatterwhite Noble, 1869. The painting won a silver medal at the 1869 Cincinnati Industrial Exposition. 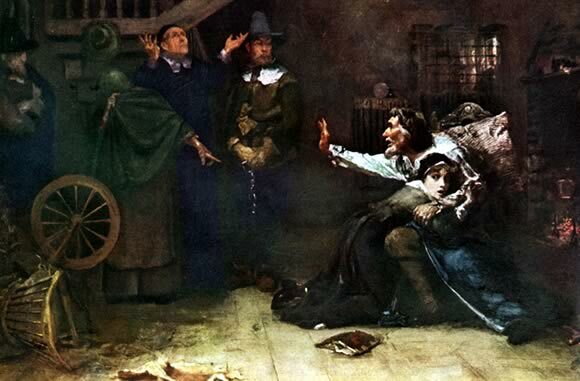 Noble gained a reputation for his dramatic paintings of abolitionist subjects, and later turned to the Salem witch trials for another powerful moral theme. A tradition in the Noble family holds that the model for Witch Hill was a Cincinnati librarian who was a descendant of a woman who was executed in the Salem witch trials. Source: Thomas Slatterwhite Noble 1835 - 1907. By James D. Birchfield, Albert Boime, and William J. Hennessey. Lexington: University of Kentucky Art Museum. Collection of the New York Historical Society, 1988. Caption: "Witchcraft at Salem Village." Description: A generalized courtroom scene showing an "afflicted" girl fallen on the floor in front of the judges bench. 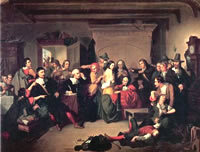 An accused woman stands in front of the judges holding her right hand over her heart and gesturing upwards, as if in the act of declaring her innocence before God. Source: Pioneers in the Settlement of America by William A. Crafts. Vol. I Boston: Samuel Walker & Company, 1876. Artists: F. O. C. Darley, Wm. L. Shepard, Granville Perkins, etc. 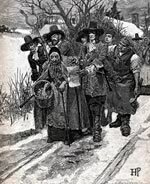 Descrption: A generic scene that shows a woman being arrested for witchcraft, depicted conventionally as an old hag by the famous illustrator Howard Pyle. 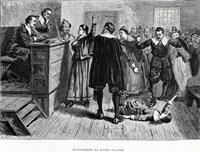 The picture illustrates an article by T. W. Higginson, "The Second generation of Englishmen in America," which briefly describes the Salem witch trials. 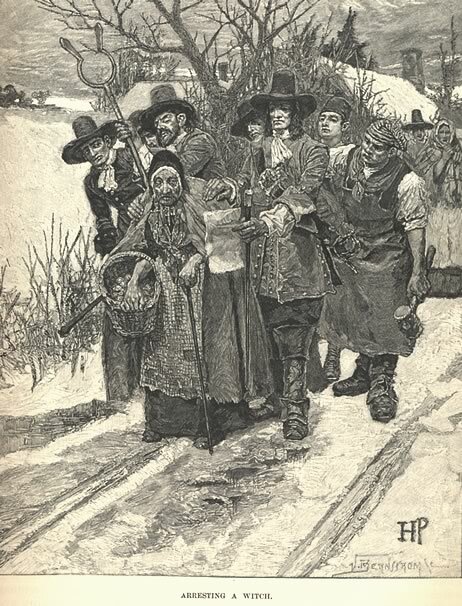 Artist Howard Pyle. Source: Harpers New Monthly Magazine, Vol. 67, (June - November), 1883: 221. Description: In this scene a young girl, who has been accused of witchcraft, clings to her father who gestures towards the authorities come who have to arrest her. A clergyman raises his head helplessly towards the heavens while the accuser, standing next to him and concealed under a cape, points towards the girl. Oil painting by Douglas Volk, 1884. Corcoran Gallery Washington, D.C. Source: Life Magazine, November, 1942. Caption: "Execution of Mrs. Ann Hibbins." 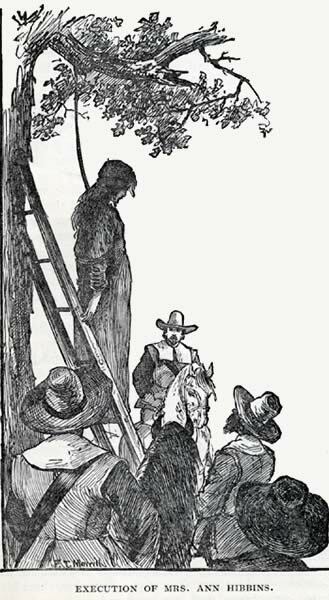 Description: Often used as an illustration of the Salem witch trails, this illustration depicts the execution of Ann Hibbins on Boston Commons in 1657. 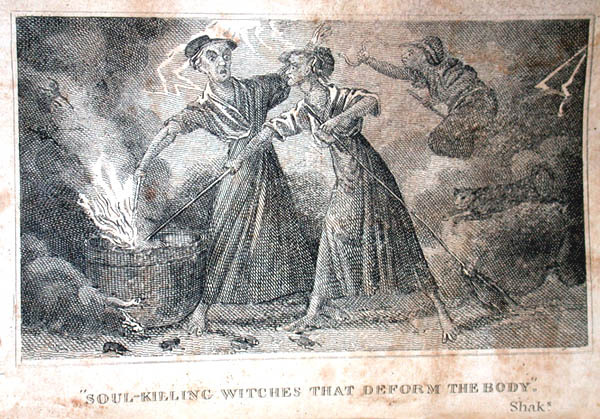 Caption: “The soul-killing witches that deform the body,” Shaks. Source: Frontispiece, The Wonders of the Invisible World Displayed, by Robert Calef. New Edition. Boston: T. Bedlington, 1828. Image by permission of the University of Virginia Library, Special Collections. © The Rector and Visitors of the University of Virginia, 2003. 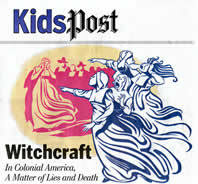 Caption: "Witchcraft in Colonial America: A Matter of Lies and Death." Description: A generic scene of the "afflicted" girls in Salem Village accusing a woman of witchcraft. 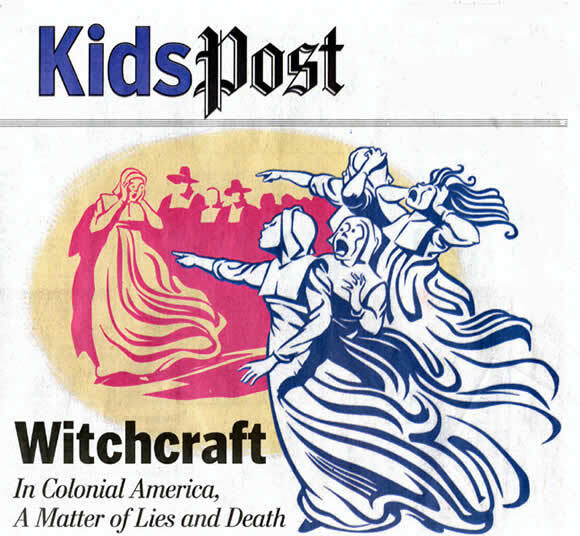 Source: Washington Post, KidsPost section, October 31, 2001. Artist; Steve McCracken. © Washington Post.